What do people in this nation know and believe about Jesus? What do they really think of us, his followers? Do those outside our churches know a practising Christian? Have they ever had a conversation about Jesus? If they have how did that conversation impact them? How do people come to faith in Jesus and begin to follow him for themselves? Answers to these questions will shape our evangelism strategy and help us understand those outside our churches better..
66% of practising Christians have talked about Jesus to a non-Christian in the past month. The contentious matter of the Lord’s Prayer advert and the Church of England’s new website JustPray.uk are mission cogs in an evangelistic strategy designed to introduce people to Jesus or nudge a few perceptions: if 40% of the population don’t know that he was a real historical figure, it makes cultural sense to begin that introduction with exposure to some of his ethical teachings, and to use Christmas – the traditional festival celebrating his birth – as the social-missional context. It is one thing to challenge erroneous public perceptions of Jesus: Christians tend to be quite good at correcting and rebuking, with love and without it. But it is quite another to inaugurate a public perception of divinity by which the whole plan of salvation may be understood. This was and is the Church of England’s challenge: mobile Nativity scenes no longer quite cut it. You may pour scorn upon the initiative, but when did you last bring someone to the Lord? The argument about whether or not the Odeon, Cineworld and Vue cinemas ‘banned’ the Lord’s Prayer advertisement is a political deflection, if not a historical distortion. People point to the cinemas’ ‘blanket’ policy of not accepting any advertising which is either political or religious for fear of causing offence to their patrons, and that, they aver, is an equitable, free and fair approach. These are, after all, private companies, and their contractual arrangements for doing business are a matter for them. I hope you’re well? Great catching up with you earlier. Please could you fill out the attached form so I can get you on our system in order to draw up some paperwork? Right, I’ve spoken to my boss and after a lot of toing and froing I’ve managed to get you a better offer. We’re offering 55% off if you were to sign this campaign off in the next 2 weeks. Obviously we need to move quickly to get the sign off anyway (the reel is 60% full for Star Wars already) but we’re extending this offer as a one off to incentivise an initial spend. This is the absolute limit of what we’re able to offer (I’m very surprised I’ve managed to get you this!) so let me know if you’re happy to go ahead, and I’ll put the paperwork together. Can you call me tomorrow and talk me through what we need to do in terms of next steps ? Hope you’re well and had a good weekend? Massive apologies for the delay in getting back to you, it’s been crazy here over the last few days! Just tried to give you a call but couldn’t get through but will try again in an hour or so. Mate, I’m afraid I’ve got some bad news, it looks like we’re going to be unable to carry your ad in our cinemas. Really sorry about this, as I know a lot of work has been put into the planning of this from both ends and it’s a really disappointing outcome for both of us. We initially thought it would be fine as long as the BBFC and CAA approved the copy (which would be more than likely). 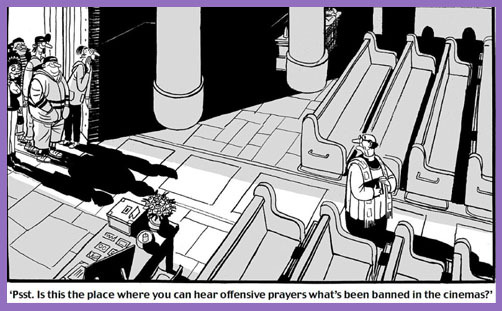 However, after our exhibition team spoke to our exhibitors themselves, Vue, Odeon and Cineworld have told us that they can’t carry any ads of a religious nature. It’s similar to the rules about political advertising- basically the exhibitors can’t be seen to have any manifesto or motive of their own, be it political or religious. Our hands are tied by these guys so it’s a massive shame and I’m pretty gutted about it, apologies again for any inconvenience this has caused. Please give me a call if you have any questions about this or would like any more information. I was sent an email by my Head of Brand Marketing, Delia Atkinson, this morning that you had sent to her a few weeks ago but seems to have been held in our email filter. I’d be more than happy to discuss the DCM position on this as a Board Member of DCM but also as a member of the ODEON (UK & Ireland) management team. My contact details are below. I am travelling up to Manchester at the moment but could make a call later if you are free at all ? Many thanks indeed for this email. Would you be free anytime between 2-3pm today to talk ? I have just got off the telephone with Andy Edge Commercial Director for Odeon (who jointly own DCM with Cineworld) and a Board Member of DCM. I go into some detail below as this note serves as an aide memoir of the conversation. He began by saying that this was a straight decision on the basis that DCM had a policy which is that they don’t carry religious or political advertising. I pushed a little on whether it was a “policy” given that this policy seemed to be unknown to their account executives. I explained that at the outset of our negotiations with DCM we had clarified that as long as it had approval form the Cinema Advertising Authority there was no issue with DCM carrying the ad. Andy suggested that the matter had been discussed by the Board of DCM at their q1 2015 meeting ahead of the General Election and they had decided that carrying political or religious adverts might offend people and they didn’t want to do that. I (gently) raised the issue as to whether he can considered that the “policy” might not be legal given that it might be arguably discriminatory and used the B&B owners case as an example where businesses need to offer their services to all without discrimination. He recognised the issue immediately, conceded that there had been no legal consideration of the policy, that it might not be so much a policy as a “steer” and that he could understand entirely where we were coming from. He thought it was an interesting issue and volunteered that the cinemas might be offending people who had lost loved ones in road traffic accidents by carrying car ads and hence was alive to the “philosophical” nature of the decision and where lines had to be drawn. I suggested that this might be in a different category that “philosophical” given the legal requirements on businesses to offer services to all those covered by equality legislation on an equal basis. He took the point and wants to works with us to resolve the issue. He asked to see the ad letter we sent to the CAA which he will take to his managing director and discuss with her tomorrow. He is keen for a resolution next week and we have booked a conference call to follow this up on 8.30 Wednesday morning next week. We may yet be in the Star Wars ad reel. Wondering whether there had been any progress as yet ? One of the DCM Directors, Paul Maloney, has been looking into this and he told me yesterday that according to the ASA, as a media owner it is at the discretion of DCM as adverts that it decides to carry or not carry. I am also speaking to our legal council today just to check that it’s her interpretation too. I have also spoken to Paul and said that I would like to discuss as an agenda item at our board meeting on Friday. I have a meeting this Thursday where I need to make some final decisions about the ad in terms of funding and would therefore very much welcome an update from the board meeting on Friday and update from your legal counsel. Consequently I would be very grateful indeed if you might be able to update me on your decision whether to carry this advert or not. We did indeed discuss this at the board meeting as promised. I have copied Paul on this note so that he can give you the DCM policy situation so that you have clarity ahead of your meeting on Thursday. Many thanks for your email. It sounds like we are nearing some form of resolution. Paul I look forward to hearing from you soon. I write further to your contact with one of our Members Andy Edge. Having now fully looked into the matter, I am afraid that we will be unable to take forward the proposed Church of England advertising campaign. As I think you are aware, DCM has a policy not to run advertising connected to personal beliefs, specifically those related to politics or religion. Our Members have found that showing such advertisements carries the risk of upsetting, or offending, audiences. We at DCM had first-hand experience of this risk recently when we and our members received considerable negative feedback from audiences following our decision to allow both Yes and No campaigners to run adverts in the lead up to the last year’s Scottish independence referendum. Having learned from this episode, as well as paying close regard to our obligations under the CAP Code and equality legislation, the Board of DCM took the decision not to run any advertising promoting any religion or political views in the future. For this reason, we are unable to take your request forward. I know that this will come as a disappointment; however, I hope you can understand and accept the rationale for our decision. You are right, of course, when you say this news comes as a disappointment. You refer to “a policy not to run advertising connected to personal beliefs, specifically those related to politics or religion”. Reflecting the spirit of openness and amicable (dis)agreement in which Andy and I have approached this matter I would be very grateful if you might send me a copy of the policy so that I can further understand the reasons for the decision. Whilst understanding your actions in relations to political campaigns following the comments you received after the Scottish referendum I am unclear where the link to religion comes in and am hopeful the policy will make that a little clearer to me. Many thanks for your email. There is no formal policy document that I can share with you, but the policy is as set out in my earlier email, in which I also explained why it was adopted. I am sorry not to be able to help further. A ‘policy’ which is not written in a policy document is not a policy. A ‘policy’ which was not previously disclosed to the client and only subsequently set out in an expedient email is not a policy. 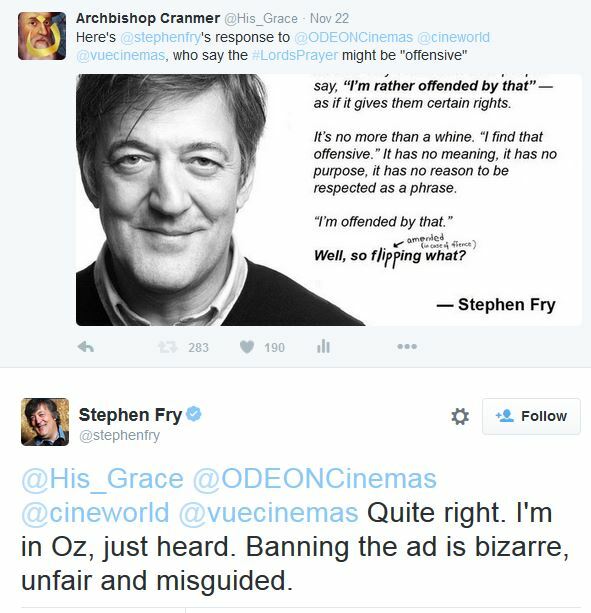 A ‘policy’ of which the cinemas’ own media agency – “the market leader in UK cinema advertising” – is not aware, but then conveniently posts to its website when the Church of England goes public (and Stephen Fry gets involved), is not a policy. Digital Cinema Media have every right to decline an advertisement which fails to comply with their company policies, but it is not unreasonable to assume: i) that conditions would be pre-disclosed; and ii) that DCM employees would be familiar with those conditions and make them clear to their prospective clients. And reading DCM’s Advertising Policy further, one wonders whether, having decided that the Lord’s Prayer ad doesn’t meet ‘Required Standards’ 2.1.3 and 2.2, the DCM Team bothered to pursue the ‘Invitation to Amend’ process outlined in 3.2ff. Or is it that any advertisement proposed by the Church of England would constitute ‘political or religious advertising’? If so, why did DCM engage in “a lot of toing and froing” to negotiate a deal? How come “a lot of work (was) put into the planning of this from both ends”, if one end was unable to see the project through to its end?